Installation of WhizBase is fully automated process that requires no special skills from user - simply download the appropriate installation package, run it and follow on-screen instructions. Once the installation is completed you should configure your web server to work with WhizBase. See the instructions for the most popular web servers below. If your server software is not listed, please send us a download URL and we’ll download your server, install it (if it is free to use or has a trial version) and email you the instructions. Please note that different Windows versions and different web servers run hypertext pre-processors differently. In some cases (e.g. using an Access database or writing the files in IIS 7, etc. ), you will need to change the permissions for the folder where WhizBase files are stored, by assigning full access permissions to the user account used by web server for anonymous access (it’s a different account for different web servers – e.g. IIS 7 uses account named IUSR). For assistance with installation and configuration please email us with specific question(s) at support@whizbase.com. 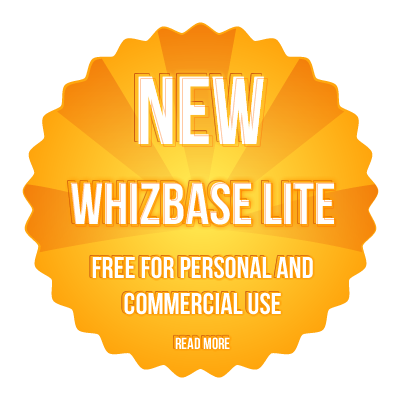 Of course, if you find it difficult to install WhizBase and configure (local) web server, you can always apply for completely free, no strings attached, trial account on our server and use it for testing purposes for 30 days.